The Gatlinburg area is the most visited tourist area in the US, and Sevierville is included in that. Sevierville is famously known for being the birthplace of Dolly Parton, with a statue of her created in her honor within the city. However, being the birthplace of Dolly Parton isn’t the city’s only attraction. There are numerous activities and areas to explore once here. 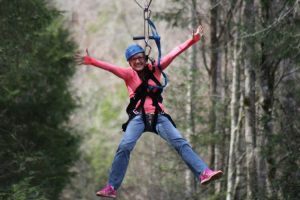 And so, from our perspective and experience, here are the top 5 things to do in Sevierville, TN. Rainforest Adventures Discovery Zoo is unlike any zoo you’ve been to. It hosts an exotic collection of animals from around the world and is located right in the Smoky Mountains. 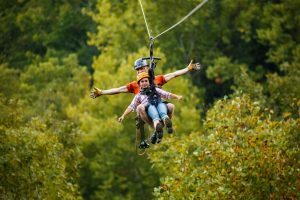 Starting out in 2001 as a pet project of businessman William Lucey, Rainforest Adventures has since grown into a must-see destination for those in Sevierville, Tennessee. Here you will find a collection of beautiful and unique rainforest creatures from all over the world. There are over 600 live animals, representing over 130 species. It truly is a place for everyone, having hosted numerous school field trips, seniors center visits, and other civic and special interest groups. Rainforest Adventures will put a smile on your face, no matter what your age! It is a MUST for all adventurers! Prices range from $8 to $11 for the entry fee and free for children under three years. They are open daily 9-5, and offer free parking. You will find Rainforest Adventures Discovery Zoo here. 109 NASCAR Drive, Sevierville, TN 37862. Or make bookings via +1 865-428-4091. An independently run non-profit foundation set up to preserve aviation history, involvement, and education. Tennessee Museum of Aviation has a collection of numerous aviation setups you can’t help but be impressed by. The Tennessee Museum of Aviation is home to many aircraft that are still airworthy, meaning they are still fully capable of flight. This is very unique, as many aviation museums don’t have planes in such great condition. Also boasting a 5500 ft. runway just outside the hangar door, visitors are able to enjoy frequent flight demonstrations. The Tennessee Museum of Aviation is the only museum in the country to have two airworthy P-47 Thunderbolts. There are less than a dozen World War II Thunderbolts currently flying in the world, so to see these planes in person is not only incredible, but a truly special experience. Open every single day from 10 am to 6 pm and 1 pm to 6 pm on Sundays (except for Thanksgiving and Christmas), if you are an aviation enthusiast their hanger is a MUST DO experience. The parking space is large, and the staff and tour guides are friendly and knowledgeable of the history of aircrafts and all aviation. The exhibit gallery is air-conditioned, and the massive aircraft hangar is comfortably heated during the winter months. It is free for children under the age of 6 with the general admission price set at $12.75. 135 Air Museum Way, Sevierville, TN 37862. For further information and bookings call +1 (865)-908-0171. Love museums and artifacts, but want something a little different? Alcatraz East is a unique experience that allows its visitors to witness the history of crime in the US. Whilst its namesake is featured heavily throughout the museum, you will be taken through the history of American Crime and see much more than just that of the famed Alcatraz penitentiary. Fans of CSI and mystery solving? There is a whole gallery dedicated to crime scene investigating. Not only is this fun for the adults, but junior detectives as well, with activities aimed specifically for kids. Open 365 days a year, this is definitely an experience to check out when looking for something a bit different. Admission for adults is $24.95, children $14.96, and under 6 are free. Or call ahead for reservations (865)-453-3278. Your Sevierville experience isn’t complete until you’ve experienced this unique hiking adventure. Smoky Mountain Llama Trek provides you with perfect the outdoor adventure for you and your family. You get to experience scenic views and mountain trails accompanied by an experienced guide. That is, of course, in addition to the friendly, fluffy, professionally trained pack-llamas. Anyone can take their family on a horseback ride, but Smoky Mountain Llama Treks takes your adventure to another level with their endlessly fun llama treks! This is truly one of Sevierville’s top 5 things to do. Experience the Smoky Mountains while trekking and leading the llamas – Taylee, Black Jack and JJ Bird just to name a few! They help to carry your gear and nibble mountain wildflowers while you relax and enjoy your hike. Llamas are very friendly, and most of them like being petted, hugged, and even kissed. You can even bring snacks for them. There are one or two guides leading every trek. The guides are trained in CPR and emergency first aid to ensure your safety along the trails. There is provision for camping as they offer overnight packages and provide the camping gear for up to eight campers. 640 Padgett Mill Rd, Cosby, TN 37722. Call (423) 487-0600 to book private hikes. Last but not least, of course, is Foxfire Mountain Adventure Park. 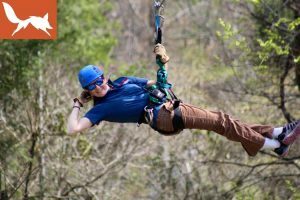 We are a family outdoor zip line and adventure park with beautiful, scenic views and striking landscapes. 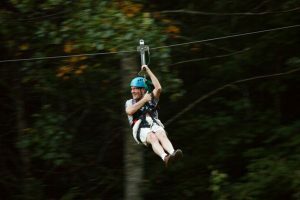 We have the longest zip line across the Smokies, giving you a safe, fun and memorable time out. Located just miles outside the city, it is a must visit if you are in town, and we accommodate families of all ages. Foxfire Mountain Adventure Park was previously a family farm, which was converted in 2010 to the park it is today. We are proudly family owned and operated bringing our guests a more personal experience. The activities within the park are endless, from ATV riding and zip lining to the rope course and climbing wall, this is an incredible experience for the entire family. It’s not just riding around, you can also chill out with great food or check on the onsite ‘Cidery’- Wyile Cider Barn, where you can get handmade ciders. The tour guides are friendly, fun loving, efficient, professional and safety conscious. Admission to the adventure park is $10 to $20. The zip line tour is about $88 while the ATV riding costs $68. You can call (865) 446-5149 for bookings and reservations or just book online. or call ahead for reservations (865) 446-5149. So there you are! The top 5 things to do in Sevierville. Enjoy and have fun!